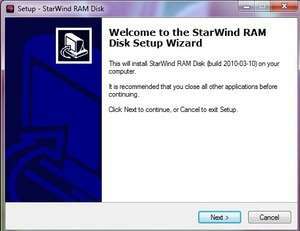 StarWind Free RAM Disk is an exceptionally fast virtual disk that entirely resides in the random-access memory (RAM drive). It allows for quick file access and significantly improves the system performance by storing temporary/cache files. The system treats RAM disk as a locally attached Hard Disk Drive. Note: The content of a RAM disk will be lost if a host is turned off, restarted or a RAM disk device is deleted. Version 5.6 is a freeware program which does not have restrictions and it's free so it doesn't cost anything. For security reasons, you should also check out the StarWind RAM Disk download at LO4D.com which includes virus and malware tests. Additional screenshots of this application download may be available, too.